The three-tower, million-square-foot office and retail complex on Bloor Street West already had lots going for it. It has direct access to the Islington subway station and is adjacent to a MiWay transit hub. It’s in close proximity to the Queen Elizabeth Way (QEW) and Highway 401 and a 15-minute drive from downtown and Toronto Pearson International Airport. Class-A Bloor Islington Place is more than 20 years old and is LEED Gold-certified. CBRE is the property manager. * and appeal to both urban (transit-connected) and suburban (driving) employees. A grocery store will open on the property this year. On the management side, Starlight instituted an active leasing program, which began with tenant interviews conducted during the due diligence process. The program includes seeking out high-growth tenants and sectors, as well as strategic stack planning and relocation planning. Put it all together, and you have a recipe for success. Global snack food giant Mondelez International signed on and technology startup Flipp expanded from its initial requirement. Bloor Islington Place has seen its occupancy rise from 78 to 98 per cent, while rents have increased by 10 per cent. Starlight, its affiliated True North Commercial REIT (TNC REIT) (TNT-UN-T) and joint venture partners have executed on a number of opportunities to acquire assets that fit the near-urban parameters at attractive capitalization rates. * and Bluefrog Business Campus (owned by TNC REIT), on Eileen Stubbs Avenue in Dartmouth, N.S., a campus-style hub within relatively easy driving distance of Halifax and Halifax Stanfield International Airport. Thompson said these properties can’t properly be compared to Bloor Islington Place with regards to occupancy and rent increases because of market differences, but noted that all have been successfully repositioned. It appears there are more to come, too. Toronto-based Starlight employs more than 120 people. It manages $7.5 billion of multi-family and commercial properties through funds, joint ventures and club deals. 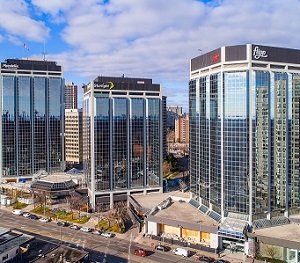 Its portfolio consists of approximately 35,000 multi-family units across Canada and the United States, and more than 4.6 million square feet of commercial properties.